Prepare cake batter according to package instructions for two 8-inch rounds. **Note: Instead of using the amount of water directed on package, substitute with milk. Leave cake in tin. While cake is still warm, poke holes all over cake. Do not poke holes all the way thru the cake, just about 3/4's in. Whip chilled heavy cream in a stand mixer fitted with a whisk attachment, or in a large bowl using a hand mixer. Whip to soft peaks and then add sifted powdered sugar in three additions. Add salt and vanilla. Continue to whip to firm/stiff peaks. At this point the whipped cream should be able to hold peak without collapsing. The whipped cream should be fluffy and thick. DO NOT OVER-BEAT! The whipped cream will get grainy and begin to separate. 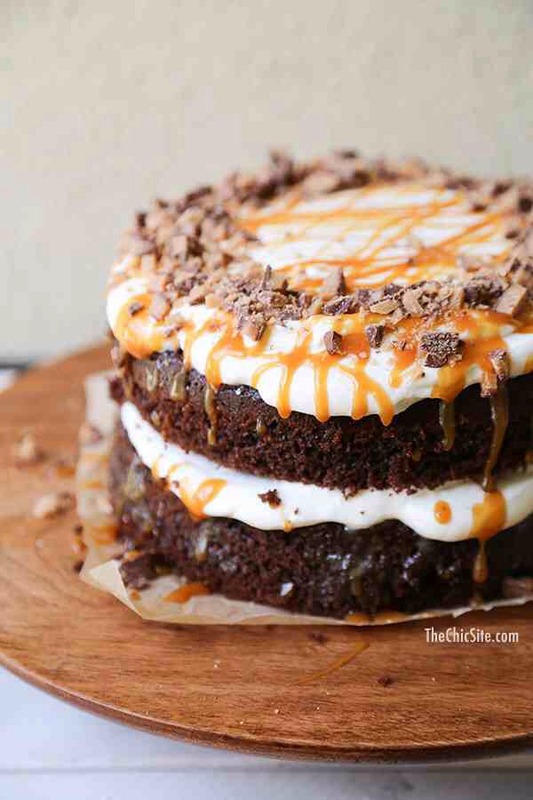 Remove milk-caramel soaked cake layers from fridge. Run a mini offset spatula around cake tin to release cake from tin. 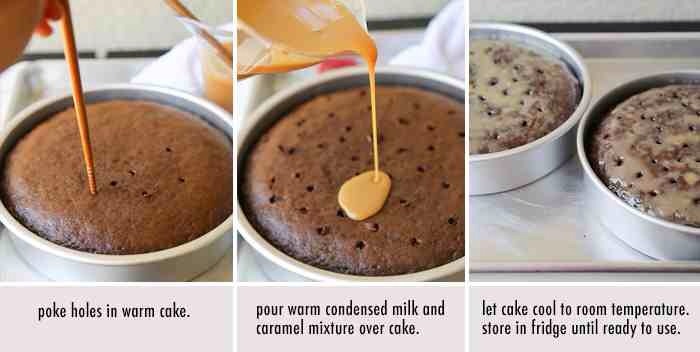 Invert cake and remove cake from tin. Place one cake layer on a plate. 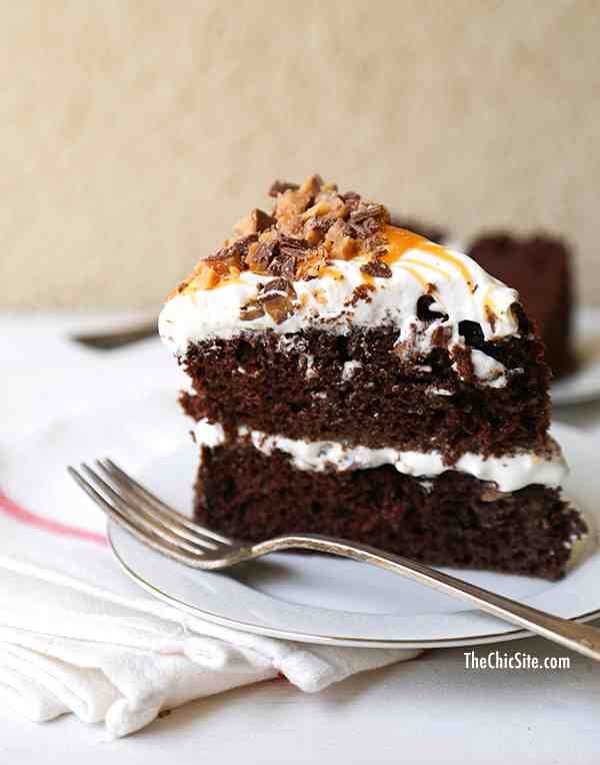 Sprinkle chopped chocolate toffee candy over cake. Follow with about 4 ice cream scoops of chilled whipped cream. 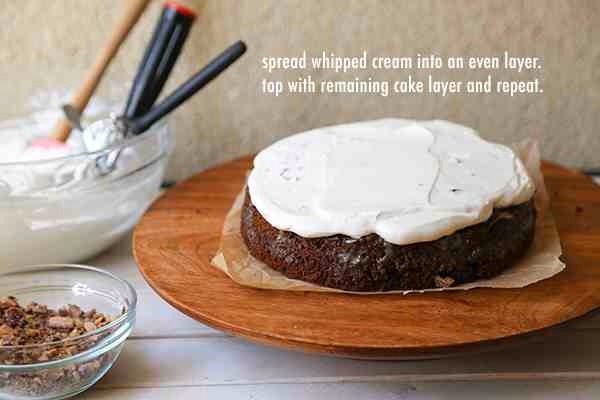 Use a mini offset spatula (or the back of a spoon) to spread whipped cream into an even layer. Place remaining cake layer on top. 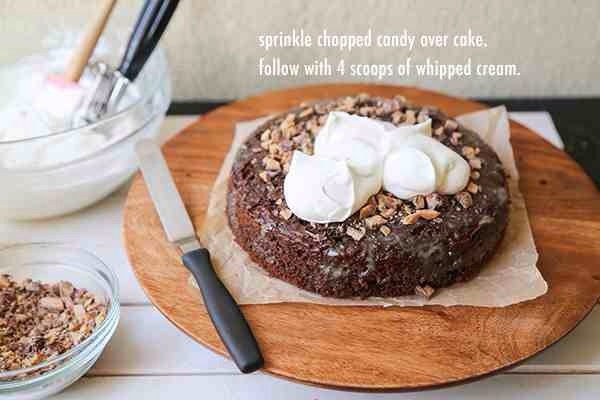 Sprinkle chopped candy over cake, followed with whipped cream. Spread into an even layer. If desired, drizzle warmed up caramel sauce over whipped cream. Top cake with remaining chopped candy. Store in the fridge until ready to serve. 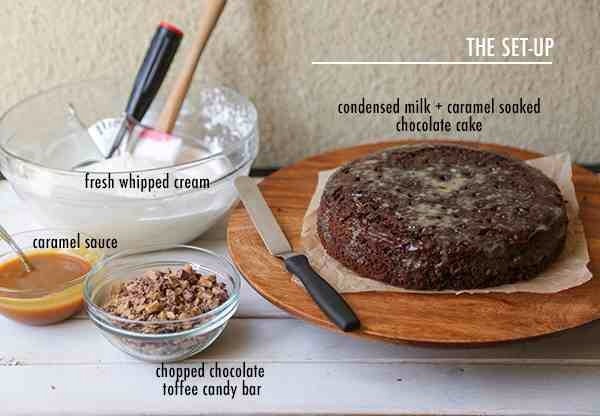 **Substitute as little or as much milk as water needed in cake mix recipe. Example: half water, half milk. I used a chocolate fudge box cake mix. ( I like the ones with pudding in the mix.) Instead of using water, as directed on box, I used milk. This makes the cake fluffier, richer, and more flavorful. Next, I used equal parts store-bought caramel sauce and canned sweetened condensed milk.